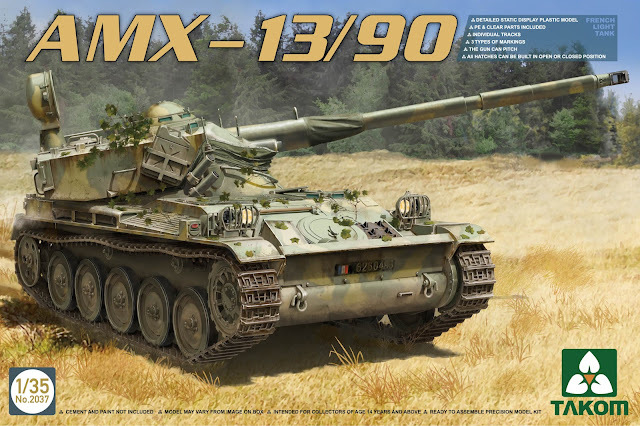 The Modelling News: Takom new AMX 13 series – 3 French tanks in 35th scale & now with boxart to tempt-ye. Takom new AMX 13 series – 3 French tanks in 35th scale & now with boxart to tempt-ye. Released on the end December 2015. 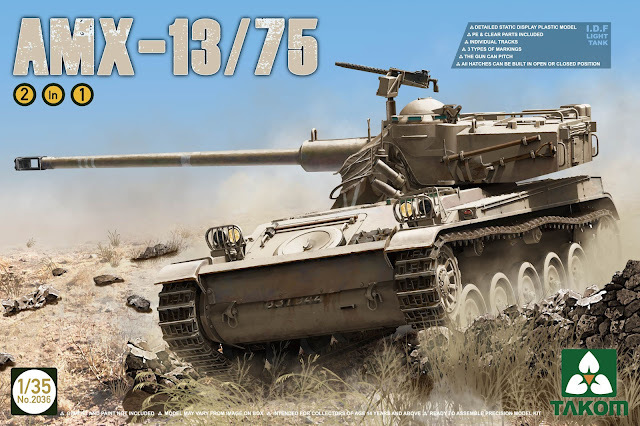 Takom’s new kit is the French light tank the AMX-13 – well it’s really three different types of the tank – the AMX-13 /75 (IDF Standard Type), the AMX-13 /90 & the AMX-13 /75 SS11ATGM. 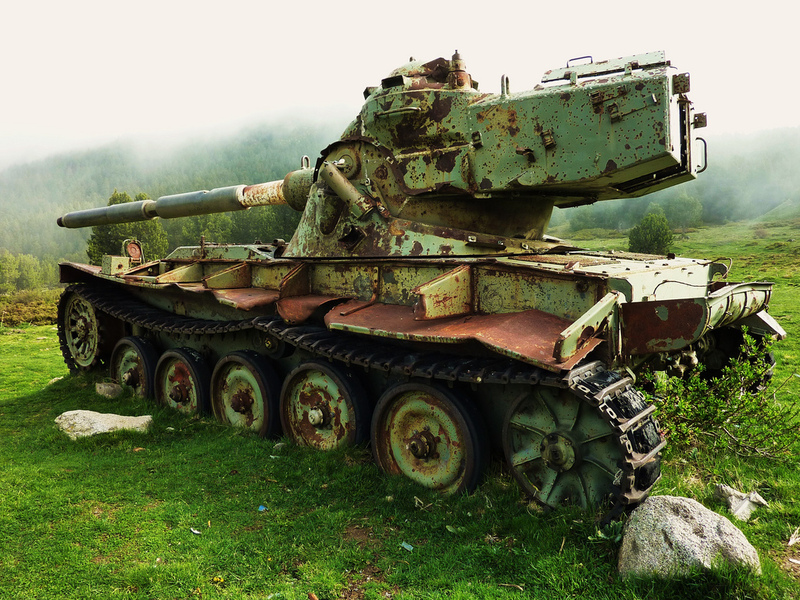 This series of tanks were sold to customers all around the world and especially in the saw action especially in the Middle East and South America. Fast and agile for a tank, it had a series of developments that make it a great choice for a new series of tanks. 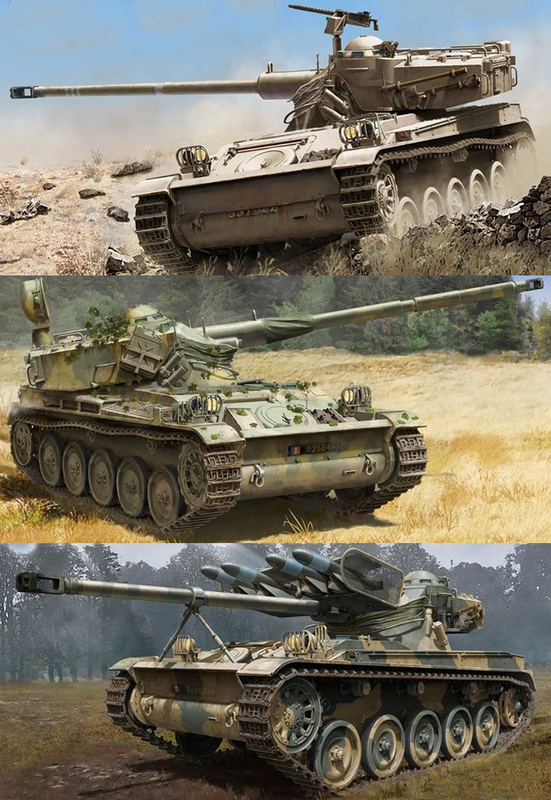 We can think of yet more tanks for Takom to make down the line but for now three will be enough for many modellers. Also as usual Mig’ company AMMO will be designing the colours for these kits so expect some colour and camouflage research to be done for you before you get the kit! 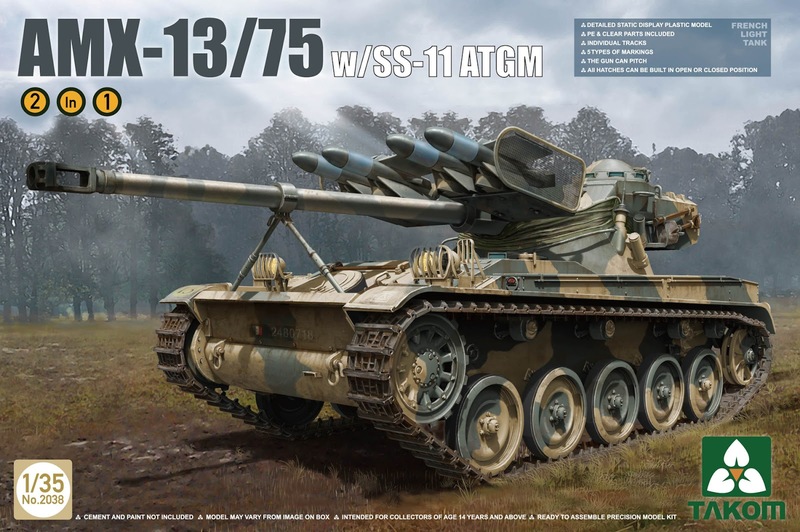 Let’s have a look at what we know so far about this new release from Takom in our preview. 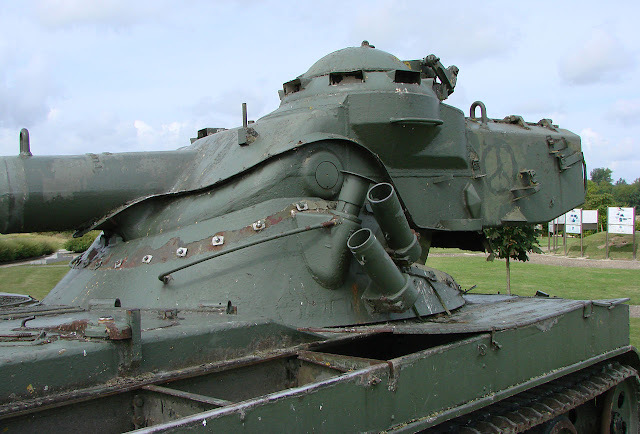 The AMX-13 was probably the best known vehicle mounting such a turret, as it was also the most used worldwide, still used by some armies today. It remains the most produced tank by any country in western Europe and by far the largest French tank production of one tank. The use of an oscillating turret in these tanks was basically a way to integrate a larger gun in a smaller turret, allowed by the use of an autoloader, while the lower part of the turret was conventional and still fully traversed. What it meant was that the whole “upper” (oscillating) turret was depressed or elevated as a single block, comprising much of its equipment and personal. In a conventional turret, the gun was elevated and depressed independently inside, the turret providing only traverse. The advantages of such a system were to provide a much smaller -thus lighter- kind of turret, which could mount a bigger gun compared to the size of the chassis, just like tank-hunters. Initially, the tank had a 75 mm (2.95 in) rifled gun, and overall 2,000 vehicles of this configuration were built for the French Army. In the course of modernization in 1965, a new 90 mm (3.54 in) rifled gun was mounted on a modified FL-10 turret. This gun had a new muzzle brake and heat insulated housing. Five types of ammunition were used, standard Armor-piercing (APFSDS), anti-personal canister, high explosive (HE), cumulative (HEAT) and smoke. 32 shots were stored, 21 inside the turret and 11 in barillets. The tank had two 7.62 mm (0.3 in) machine guns (one coaxial and one in an anti-aircraft mount) fed with 200 round bands, 3600 rounds stored in all. 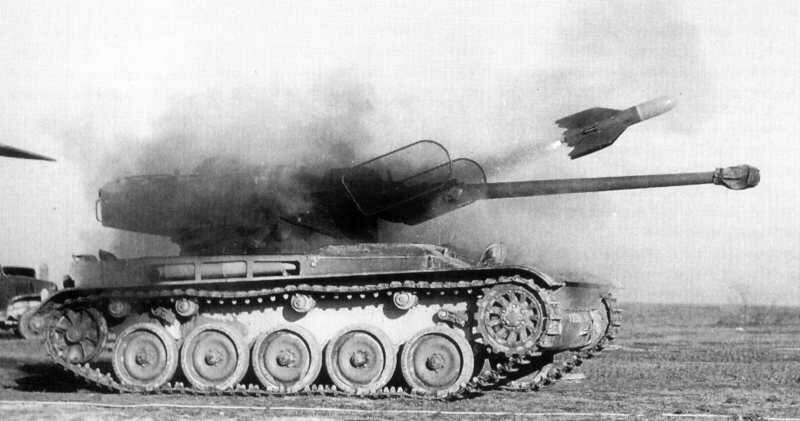 The AMX-13 protection was quite weak compared to its firepower. It was made of regular bulletproof reinforced steel sheets, with a frontal thickness of about 40 mm (1.57 in), whereas the sides and turret were 20-25 mm (0.79-0.98 om), the rear 15 mm (0.59 in), while the turret top, hull deck and bottom were only 10 mm (0.39 in) thick. Only the frontal Armor was able to withstand heavy machine-gun and small autocannon projectiles, the rest of the tank being vulnerable to most projectiles. 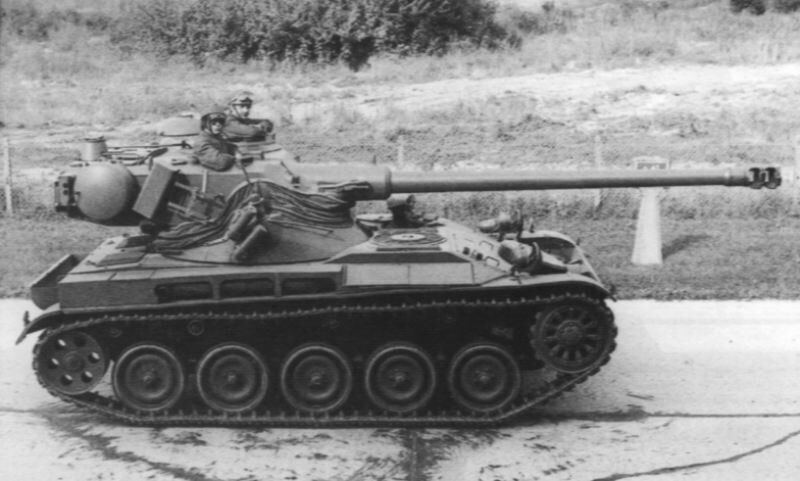 The AMX-13 was not protected with NBC gear, and night vision was optional. 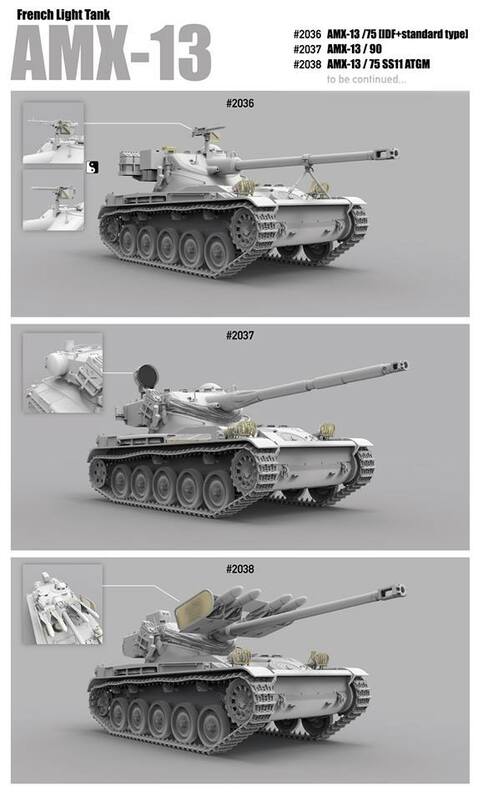 Additional Armor panels for the AMX-13were made with a weight of 650 kg (50 kg for each section). Additional Armor could be installed by the crew in the field, on the front and upper side parts of the hull and turret. To propel this around the engine/transmission compartment was at the front-right of the chassis. The motorization was provided by a proven 8-cylinder gasoline liquid-cooled engine, giving 250 hp and a maximum speed of 60 km/h (37 mph). The fuel tank capacity was 480 litres, reserve sufficient for nearly 400 km (248 mi). The AMX-13 had a ground clearance of 370 mm (15 in), could cross a trench 1.6 m wide (5 ft 3 in), climb a vertical obstacle 0.65 m (26 in) tall or 60° side slope, or ford a 0.6 m deep (24 in) river. 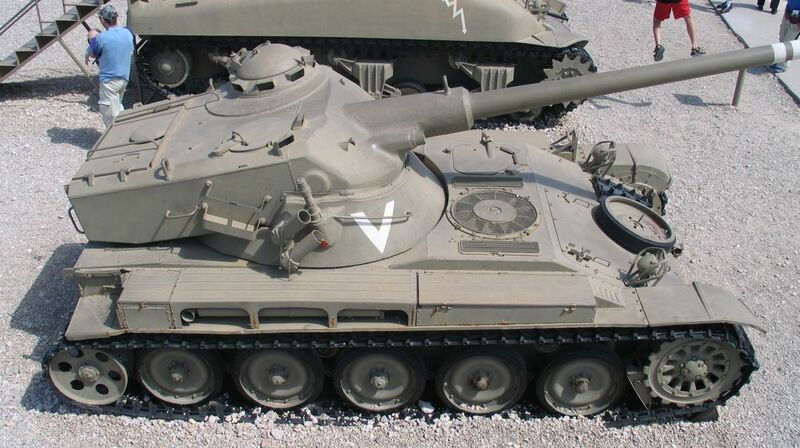 The AMX-13 was produced from 1952 to 1964, and under license in Argentina until 1985. It has experienced many upgrades and was exported to 25 countries (out of more than 7000 vehicles produced, half were exported). The AMX-13 chassis was used for conversions including self-propelled artillery and anti-aircraft guns, armoured personnel carriers and bridge-carriers, and others. 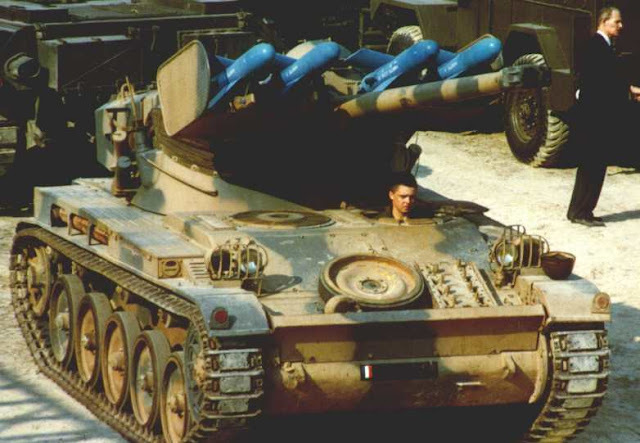 AMX-13/75 was used by the Israeli’s in many conflicts in the Middle East in the 60’s before they were retired and sold to Singapore in 1969. This kit from Takom features two different types of machine gun atop it’s oscillating turret as well as photo etched details including brackets and light bulb protecting grilles. 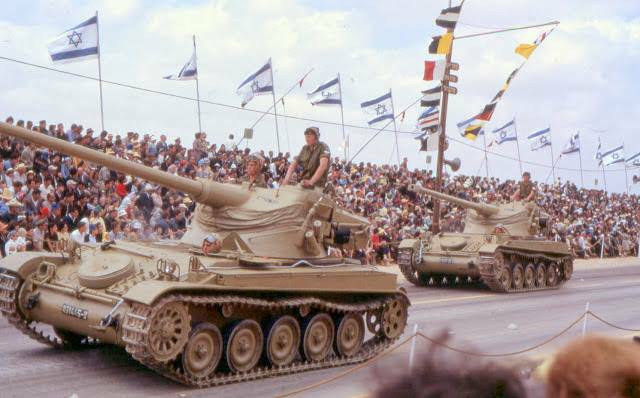 AMX13 was Israel’s first modern tank, purchased at a time only France was willing to openly sell arms to Israel. By 1956 Israel had received 180 AMX-13 light tanks. They were used heavily in the Sinai Campaign & the Six Day War. 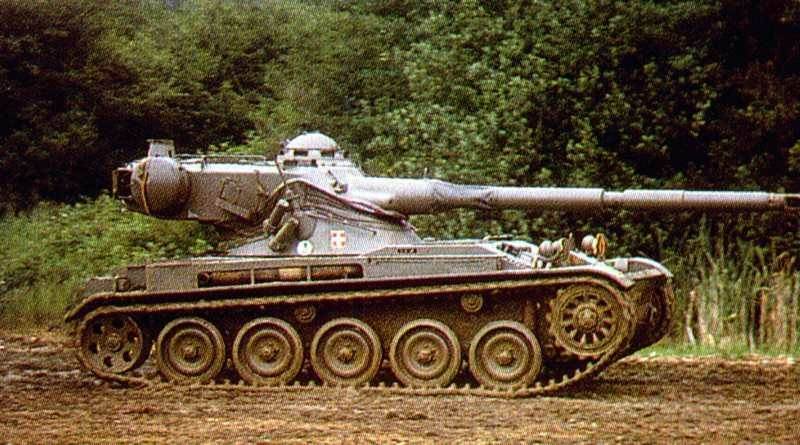 From 1966, the 75mm high-velocity gun was replaced by a 90 mm (the AMX-13/90) medium velocity gun firing more effective HEAT ammunition, with the French upgraded all of their existing base models to this specification. This kit features the newer bigger gun fitted to the FL-10 turret modifications. The Main Gun had a thermal sleeve and late fitted with a Laser Designator for a weapons system that required two six-round ammunition drums and turret basket ammunition racks with an automatic loading system. Not sure if any of that will be shown on this model however! 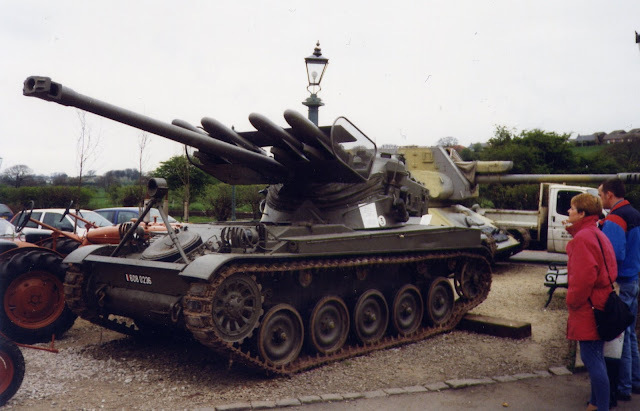 AMX-13 T75 fitted with four SS.11 ATGM launchers to upgrade the effectiveness of the 75mm Main Gun at the time, the decision was made to fit a launcher on top of the main gun, that fired x4 SS-11 ATGM. It was later re-designated “AMX-13 T75 avec TCA” once it was fitted with an electronic guidance system for the missiles.